Our June 3rd meeting was filled with practical information from local beekeepers. Bill Catherall gave a great presentation on beekeeping record keeping. He’s a big advocate for record keeping so you can do “bee math” in order to plan well by anticipating when brood will emerge. 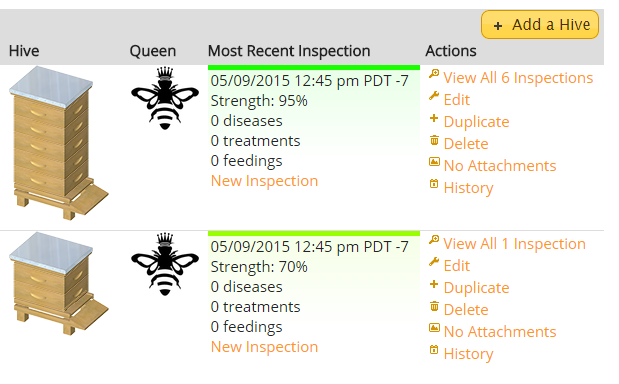 Additionally, record keeping is a great tool to track your hive’s health. Bill showed us all sorts of innovative tracking tools, including using bricks, paper templates, and duct tape. He reminds us that whatever works for us is the right way to do it! Dewey Caron was back this month with advice on what to do in the hive this month. He reminds us to challenge the bees by giving plenty of super space. He warns that this year might not be a great year to harvest all of the supers. This is an early year, and the bees might need that extra honey to overwinter. Dewey recommends starting to test for mites. Testing early gives us a baseline so that when we take fall mite numbers there’s some context. Dewey also presented some early results from the Pacific Northwest Honey Bee Survey. Good news shows less loss than last year! To check out the survey, visit http://pnwhoneybeesurvey.com/survey-results/2015-survey-reports/. Dewey and his team are still crunching numbers, so stay tuned for more exciting results. If you find this information helpful, please participate in next year’s survey! Our main event was a Q&A panel, moderated by Dewey Caron. The panel consisted of three beekeepers with varying backgrounds. Mike card is a fourth year beekeeper with seven colonies. Kerry Jahanne, a beekeeper and orchardist and recent transplant from New York has 14 years of beekeeping experience. While she managed 40 colonies in New York, she’s still looking forward to starting her first in Portland. Our final panelist was a Portland beekeeping fixture and PUB veteran, Glen Andresen, who has 25 years of beekeeping experience and currently manages 80 hives. The questions revolved mostly around the pros and cons of foundation vs. foundationless, and the ways to track and manage mites. PUB is excited to be sponsoring the bee booth at the Oregon State Fair on Saturday, August 29th. Come say hi! 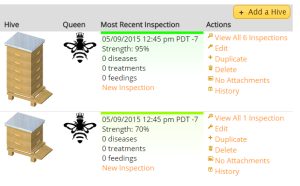 It is often recommended to new beekeepers that they should keep inspection records. Upon learning this, some would-be-beekeepers set a goal to keep meticulous notes and journal entries. But once they start working with the hive and juggling everything that goes on during an inspection, plus dealing with the thousands of bees and the euphoria or panic that can bring, record keeping is often forgotten. Or, many beekeepers just don’t know what kind of records to keep. How detailed do these notes have to be and how do they get it recorded with a busy schedule? After a few months of not keeping records at all, they may even fall into the mindset that it just isn’t needed. Let’s first tackle the why of record keeping. When you have just one hive and you’re fairly new to beekeeping, it isn’t a very difficult task to remember everything that’s been going on with it. Unfortunately our memories can only recall that information for a finite period of time and then it is soon forgotten. Once you start accumulating more beehives, it becomes an even more difficult task to remember all the details. Or worse, you might get mixed up or confused about the various hives. Just ask my 3 children how good I am at keeping their names straight. So the reason we make notes is mainly to help us remember what we did and saw at each inspection. These notes are important to helping us diagnose any problems we might see. They can be helpful when planning what to do next. 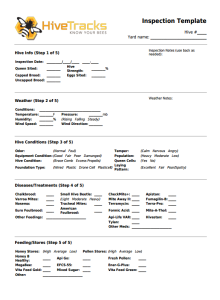 Or when evaluating different methods or treatments, records become critical to understanding the effectiveness. That brings us to wondering what we should be recording. At the very minimum, the hive records should indicate the date of the inspection, the health and behavior of the bees, and any changes the beekeeper made to the hive. I recommend also going one step further and recording what needs to be done at the next inspection with a “to-do” date as necessary. What kinds of “health and behavior” items should be recorded? Signs of disease? Symptoms or diagnosis? 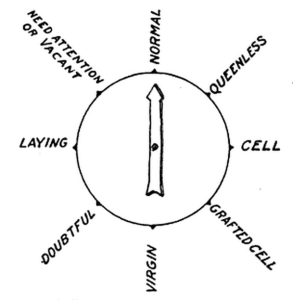 Brood health or laying pattern? But that’s a lot to record. How on earth do I do it? This is really a personal preference and no one right way to do it. There are a few tools out there to help you, or you can create your own method. It can be as detailed or as simple as you want. Any effort is better than no effort. Here are some ideas. These can simplify record keeping by prompting you with the things to record and organizing it in an easy to read way. It’s also nice to have the records available to you anywhere you are, whether at work or home. There are a couple popular tools. Each of these have a simplified, limited free version, but otherwise require you to pay. This year PUB is getting a special offer to use the full version of Hive Tracks for a year for free as we help them test and improve the Groups feature of the software. If you would like to get a free year of Hive Tracks and help us test these new features, please email the PUB officers for details. Either a hand-held audio recorder or even a dictation app on your smartphone. Recording a quick sound-bite to send to someone else (a beekeeping partner perhaps) or to yourself for later recording is a great way to make some on-the-spot notes. Taking photos or even video of the inspection can help in many ways. Digital photos would be time-stamped and can show things that are hard to put down on paper. Video can help us to see mistakes we might make as beekeepers and improve our technique. Some people have even come up with clever codes or short-hand. You can attach cards or even dials on the hive for marking status. If you use a brick on the lid this can also be used to indicate the state the hive was in during the last inspection. The limitation of these methods is that they don’t indicate the date, but there are clever solutions to that. More importantly, it’s not a lasting record that can be referenced in the future. Part of beekeeping is learning year over year. Having records to review what happened the previous year (or years) can prepare us for the up-coming season. But this method can be good for quick notation or communication to other beekeepers who work the same apiary. One very clever and simple hive marking technique used by Michael Palmer is using duct tape on the lid and writing on it, in his own short-hand, with a permanent marker. Whatever method you use to keep track of your hives’ health and your interactions with them doesn’t really matter, as long as it works for you and is something you can keep up with. I recommend that beginners start with a check sheet of some kind. As you become familiar with filling it out, you’ll start getting into the habit of looking for the things on it. Once you become more comfortable with inspections and the check sheet, you can start scaling back and only record the things you find helpful and useful to get down on record. Eventually you’ll strike a balance that works well for you.